Chanel have that magic thing at the moment, where every colour they launch is so on trend that it creates the trend – with other brands just scrabbling in their wake to catch up. I always wonder how brands manage to capture that magic, bit it’s Chanel’s moment and they have ‘it’. Of course they already did this with Jade, Particuliere, Nouvelle Vague, Paradoxal… they have had their finger on the pulse (or they have the most amazing PR/marketing campaigns) for seasons now and with the new Khaki range it’s no difference. Is it because it’s Chanel, or is it the colour? 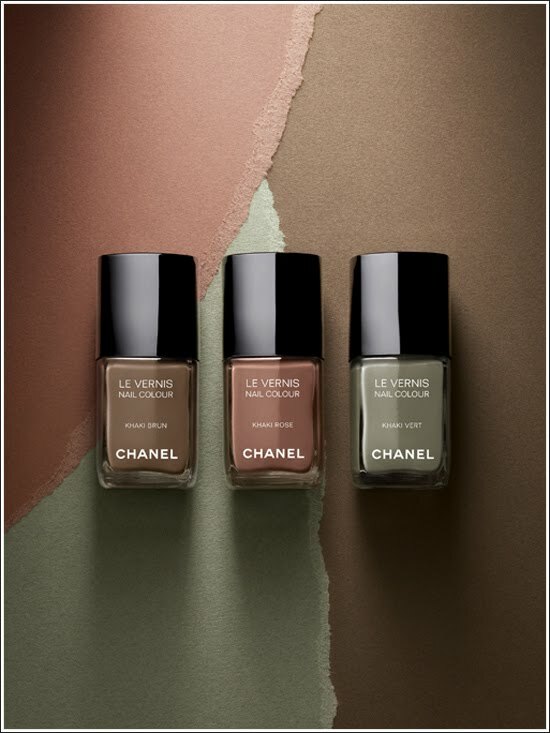 Either way – gorgeous, I love all three shades. These hit stores (Selfridges and Chanel stand alone stores only apparently) in September so getting your hands on these will be a challenge. Worth it? Or wait for the dupes to come out…. I think it’s tough to beat the feeling of owning a little bit of Chanel. I definitely want these too! The orange-y one looks a bit yuk. And the other two are surely dupe-able. Luckily I have a Chanel watch so I don’t lust after the polishes. But I wouldn’t get these. The only one I really WOULD have got is Mint. But Dreamcatcher is an excellent alternative. My favourite is the Khaki on the right, I quite like the pinky/orange but pretty sure but I don’t think it would suit my skin tone. The other one looks very Pariculiere! On another note, I recently came across you blog and have been dipping into the archives-you’re reviews are great-very honest and helful!!! @LionLovingTiger – that’s a good point! I do have a bit of a thing for khaki at the moment so may pick that up if it was Rimmel, but the other two I would definitely skip. I’m not too keen on the green but the other two colours look delish… I predict another big sell out! I’m totally in love of this colours! Good choice.